If you are looking for employment opportunities, we post job offers, and we maintain this job posting sites with data's sourced or mined from the POEA job's order bank. Check on the following post job offers, and employment list for the best possible employment or job that may suit your qualification. The following are job orders bound to countries like Qatar, Bahrain, Kuwait, Pakistan, Saudi Arabia, Oman, Brunei Darussalam and Angola. Browse through them and click the link of the agency if you are planning to apply. 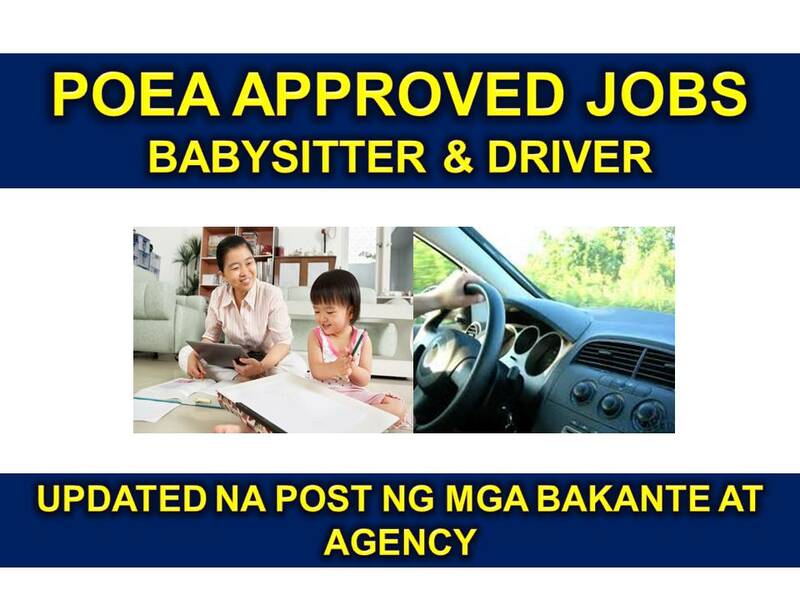 The following are the job orders approved by POEA for overseas workers with positions like Babysitter, Nanny, Driver in different countries for the month of July 2016. Interested applicants may contact the assigned agency through the contact information on the link below. We do not process job recruitment and we are not affiliated to any of these recruitment agencies. The above mentioned and linked employment opportunities or post job offers, is taken from job posting sites of POEA. If you checked on the above job posting, or overseas post job offers, and employment list, we encourage you to verify the agencies for validity of licenses.